Nothing sets off an upholstery job better than a straight French seam or topstitch. Combined with thick thread, the job really pops. In fact, you’d be surprised by how much of a difference the width of thread can make in the overall appearance of a vehicle’s interior. I was first drawn to the look of thick-thread decorative stitches by the dashboard and door panels of a 2011 Jaguar XKR. The thread’s width, the way its color contrasted with the dash and how perfectly straight its seams were instantly drew my attention. I knew right away that I wanted to experiment with the look in my own work. Now I can with QTC Contrast T-270 Bonded Nylon. QTC Contrast is a new product developed by popular demand. The bonded nylon thread comes on 8 oz spools at 800 yards per spool with a break strength of 49 lbs. 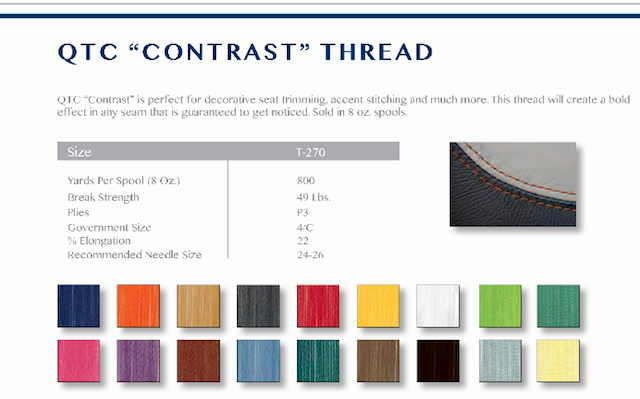 You can choose from a pallet of 12 colors and use the thread on any industrial strength sewing machine. Just make sure to wind a bobbin with the same spool and change your needle to the recommended size of 24-26. QTC Contrast costs $22 a spool. Contact Tim at George Shaw & Associates Inc. to purchase one for yourself. Believe me, the bold look of QTC Contrast will make your French seams get noticed. We just finished a 65 Mustang using this thread. Saddle brown with black french seams. Last year we finished a 66 Chevelle in black Rave vinyl, suede red highlights and white french stitching. It is a look that is gaining popularity with the custom crowd. The large stitching is not new though. I think back to the 55 Chevy convertible with what we called “Saddle Stitching” on the inserts. It may not have been quite as large as the 270 but it; was close. I only wish it was in Polyester instead of Nylon. Not sure how it will hold up in the sun on motorcycle seats. That’s a good question Bobby, my supplier assured me it wouldn’t fade but time will tell. In my experience, Nylon doesn’t have the lasting power of Poly when constantly exposed to the elements. Convertibles, bike seats, boat cushions are all done in Poly. I wonder what skin it is off the supplier’s back when your customer comes back in 5-7 years and says the seams are busting due to UV rot? I guess it matters more what guarantee you put on your work than on what the supplier claims. A couple guys on our Facebook page made a good point about usind this thread as bobin. Because of the thick width, the thread is wound with half as much length and as a result runs out much faster. Nothing is worse than running out of bobbin in the middle of sewing a French seam! Glad to see this post. Just talked to a supplier yesterday who had 245 for $26 per 8 oz. spool. I’ll gladly save $4 per spool. Up til now I”ve only been able to find 138. It does ok (did white stitching in a BMW and the customer loved it), but yes, 270 has got to be amazing for highlighting and accenting. We’ll be trying it in a 2012 Veloster that we’re doing some changes too. Send some pictures of the Veloster when it’s done. We’d love to show it off on our site. Thanks! I know this is an old thread, but what changes did you have to make to your machine besides needle size and tension (ie. Timing)? If you have used this thread did you also use it for the bobbin? Rebellion, you’ll have to wind your own bobbin to match the thread. If you’re using an industrial machine you shouldn’t have to worry about any adjustments beyond the needle and tension. I used QTC Contrast for top thread AND bobbin on my trusty Pfaff 145 H3, sewing 4-5 oz soft beautiful black cowhide Knee-High Moccasins I had HORRIBLE bobbin loops and was about to give up. One night at the machine I complained to God and said “I need a bigger needle”, knowing it would make bigger holes and pull the bobbin thread up, but to my surprise He said “No, you need smaller bobbin thread”, to which I said “NEVER!!”. My Teacher always matched top thread and bobbin thread and taught me the same, so this was Stitching Blasphemy! !–as far as I knew. But I figured I had nothin’ to lose, so I changed over my bobbin to my old standby Star Ultra Dee 12 (128) and it stitched–PERFECTLY!! I’m doing the same on a pair of Elk and buffalo ones at present. BELIEVE IT!!! IT WORKS! Problem could be more than one thing. Start with the needle. Are you using a diamond or other cutting point needle or just a round point? Tension could be too tight is you didn’t adjust for thicker thread. Less likely it could be the spacing between your needle and hook. Just some things to check if the problem doesn’t occur with the lighter weight thread. I forgot to mention on the needle, you will need a larger needle as Naseem referred to above 22-26. I’m not a fan of the 270! It just looks too big! FWIW Katzkin uses 210 on theirs and it looks about right! As far as the bobbin a fellow upholsterer that has been in the business almost 40 years recommended using a standard size thread on the bobbin. It seems to work a little better plus it’s a whole lot cheaper!! I have just started using the QTC, and it awsome , but I cant find the # 24 needle for my consew 226, any ideas on a supplier? can i use this thread on steering wheels and other hand stitched items? What machines will sew with this heavy stuff??? Will a 255RB3 handle it?? experimenting with this thread… or should i say, trying to experiment. we have a juki walking foot machine and I’m having a hard time finding a needle short enough. any suggestions? I was supposed to deliver a job a week ago. Have thread, three boxes of needles later, my supplier still can’t help me sew with it. Does anyone know if this thread will perform on an Adler 67 Walking Foot Machine? The needle plate should have a hole, enough, to let the needle and its thread, pass down through freely…if necessary change the plate, or buy another for this purpose and widen the hole with a tungsten drill bit. Tensions should be regulated also…the ‘upper tension’ is adjusted simply by loosening its nut. The ‘lower tension’ in the bobbin case has two little bolts…to do the adjustment, just loosen a little the first tiny bolt…don’t touch the other one. I think these thick threads could be used for special cases as decorative stitches…besides, as Naseem said, they easily run out of thread in the bobbin. Another tip is that the thread should be the same thickness up and down to get an evenly lockstitch.